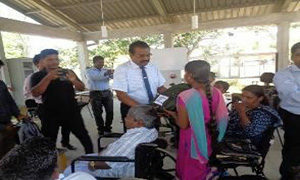 The concept of equal opportunity for all, adopted by RAHAMA was an exceedingly successful mission in it’s concern on differently abled youth under the post war setting in the Northern districts in Sri Lanka. 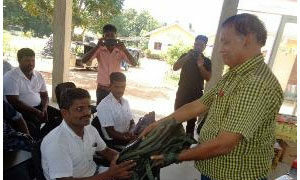 RAHAMA in collaboration with District Vocational Training Centre (DVTC) – Kilinochchi arranged an event to deliver sets of tools and equipment to a batch of unemployed youth those who successfully completed the Vocational training course conducted by the DVTC. The key objective of this collaborative project was to create self-employment avenues for unskilled youth including those differently abled youth. The required funding for this action was endowed by FORUT Norway though RAHAMA. Subashini a trained garment worker in Kilinochchi says that she is capable of earning 2000/00 LKR per week as an added income. She added “general norm is that those differently abled individuals are an extreme burden to the family. But RAHAMA together with DVTC provided vocational training also targeting self employment in particular for disabled youth also added with leadership skills and improved confidence to start an industry under self employment. Including myself the whole batch received tools and equipment to start a product unit, Accordingly those differently abled youth could improve family based livelihoods to support the family instead of depending on the family. In this respect, I extend my sincere thanks to RAHAMA, district authorities, DVTC and very specially the donors. ← Shelter & Accommodation under Resettlement.